Throw A Bridal Shower on a Budget! 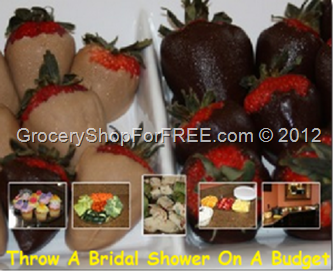 You are here: Home / DIY / Throw A Bridal Shower On A Budget! Michaela is a good friend of the family and she has started posting deals here to help me out! Yay! This weekend she threw an awesome Bridal Shower for some other family friends and today she is going to share it with you! I have some good friends that are getting married and really wanted to throw them a shower, but didn’t want to spend that much. I was able to throw a great party while not breaking the bank. Unlike most of the people I know, I made everything for the party except the cupcakes (just because I wanted them to look good.) I bought all the ingredients and made spinach wraps, veggie trays, fruit trays, cheese dip with chips, and chocolate covered strawberries. Bridal Shower On A Budget! I got all this for 25 people for less than $100!!!! I only spent $77.88!!! It was a couple’s shower so I was able to dig in a friends stockpile to find fun prizes for games we played. All in all, everyone had fun, ate good, and I was well under budget, allowing me to splurge on their gift!